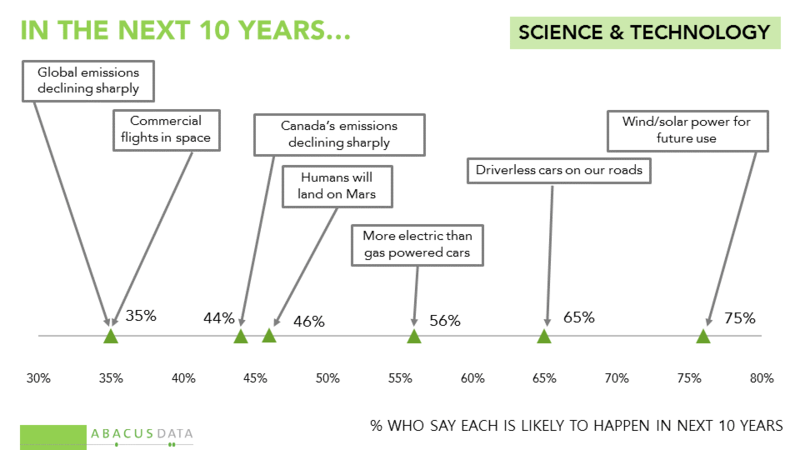 In our recent nationwide survey, we asked Canadians to tell us whether they thought a series of scenarios were likely or unlikely to transpire over the next 10 or 20 years. Our first release can be found here. • Most (75%) believe that in the next ten years a way will have been found to store energy from wind and solar for future use. • Two thirds (65%) believe there will be driverless cars on our streets and highways. • More than half (56%) think there will be more electric than gas powered cars. • Almost half think humans will have landed on Mars (46%), and 35% think there will be commercial flights in space. • Four in ten (44%) think Canada’s greenhouse gas emissions will be declining sharply, while 35% think global emissions will be declining sharply. 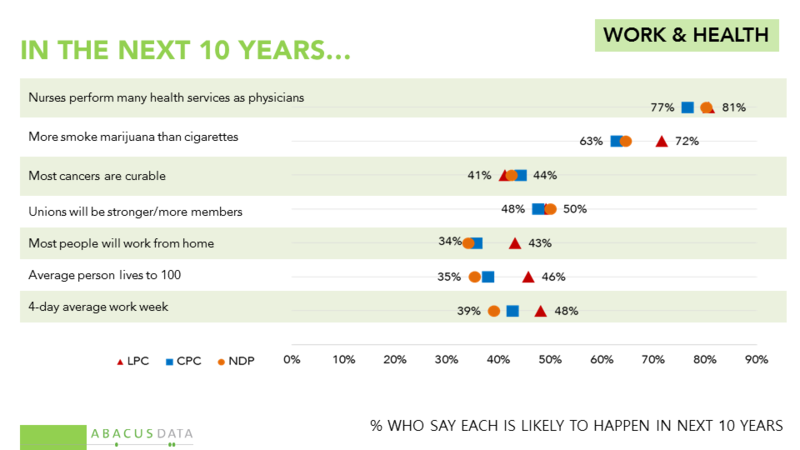 • 79% think it is likely that nurses will perform many of the health services performed by physicians in 10 years. • 69% think that more people will smoke marijuana than cigarettes. 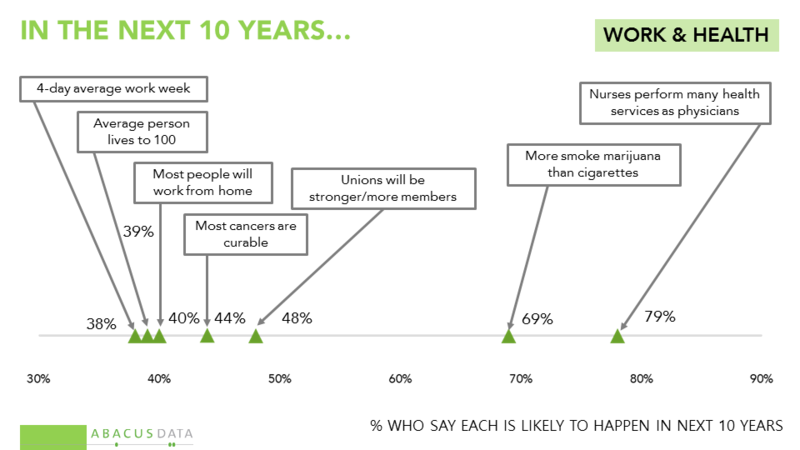 • Just under half (48%) believe unions will be stronger and have more members. 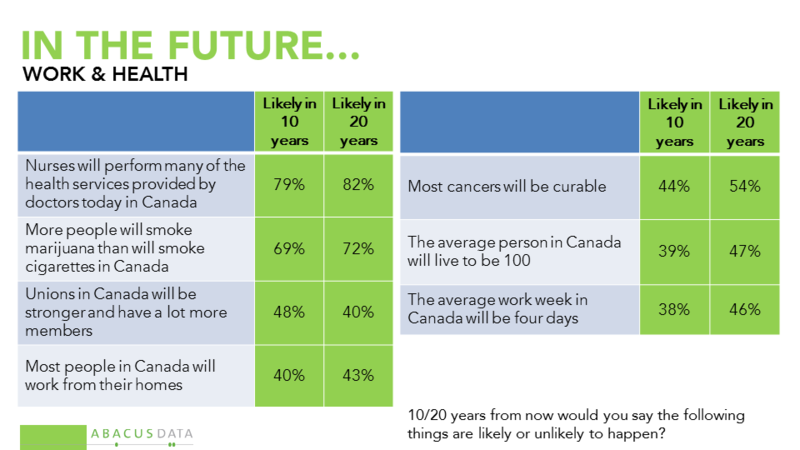 • 44% think most cancers will be curable and 39% believe the average Canadian will live to 100 years. • 40% believe most people will work from home and 38% think the average work week will be 4 days long. • Large majorities across all three major parties, believe energy storage solutions will be found for wind and solar. • Liberals are more likely than others to think there will be more electric than gas cars on the roads in 10 years, the average work week will be 4 days long, most people will work from home, and more will smoke marijuana than tobacco. • Liberals and New Democrats are more convinced that Canada’s GHG emissions will be declining sharply, compared to Conservatives. 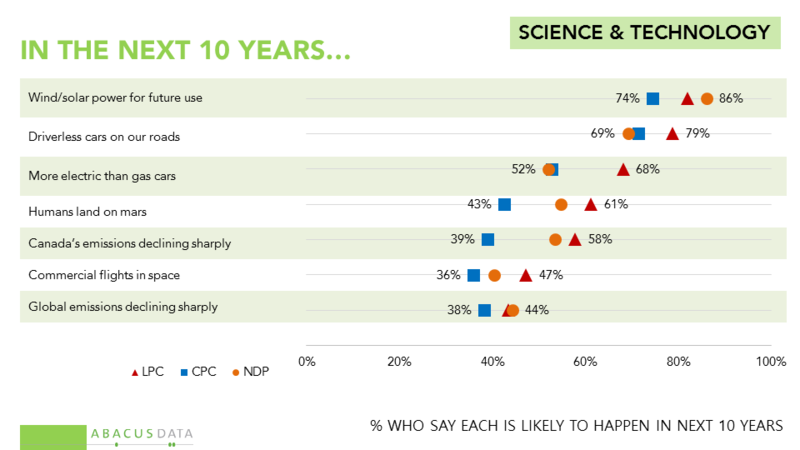 • Liberal and NDP supporters are more likely to think that humans will land on Mars. 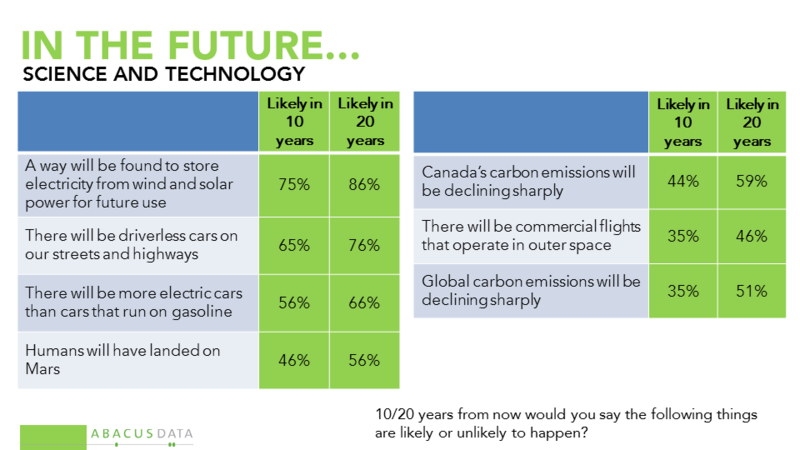 • Given a 20 year horizon rather than 10, Canadians were roughly 10 points more likely to think energy storage solutions would be found, there will be driverless cars on our streets, more electric than gas cars, humans would visit Mars, commercial flights would go into space, and most cancers would be curable. • 59% thought Canada’s emissions would be declining sharply in 20 years compared with 44% who thought this was likely in 10. • Adding 10 years to the horizon also made more people imagine the average lifespan would be 100. • In contrast, there were more doubts about the future of unions, the longer the outlook. Bruce Anderson: “Canadians are known to be risk-averse, but these numbers suggest that they are not necessarily change-averse. Several of these findings suggest there is a fair bit of optimism about the potential for technology and imagination to change our world for the better: lengthening life spans, reducing environmental impacts, and expanding our understanding of space. David Coletto: “How will our lives change in 10 to 20 years? Canadians can imagine a world that is healthier and powered by renewable energy and new technologies that today are being developed. Many of us can see streets filled with driverless, electric cars powered by energy generated by the sun and wind. We see nurses peforming many of the same health services as physicians while most of us live into our 90s and 100s. The Marketing Research and Intelligence Association policy limits statements about margins of sampling error for most online surveys. The margin of error for a comparable probability-based random sample of 1,500 is +/- 2.6%, 19 times out of 20.